- Slim and stylish 5" TFT screen design with Full-Colour high resolution LCD (800x 480) - Great for movies! - Supports an extensive range of media formats including MP3, WMA, AVI, RMVB, MP4, FLV, VOB, JPG, BMP, PNG, TXT, GTML, EPUB, PDF, DOC, RTF etc. WHY buy DRM enabled hardware - simple. Because you want to read the latest books/magazines/articles/content which can be acquired online from stores like Borders. This content is all DRM encoded. True, you might be able to "find" illegitimate e-books or read free e-books, but to read what you want when you want - you need DRM. Our new electronic book reader is a true multi media multi functional device. 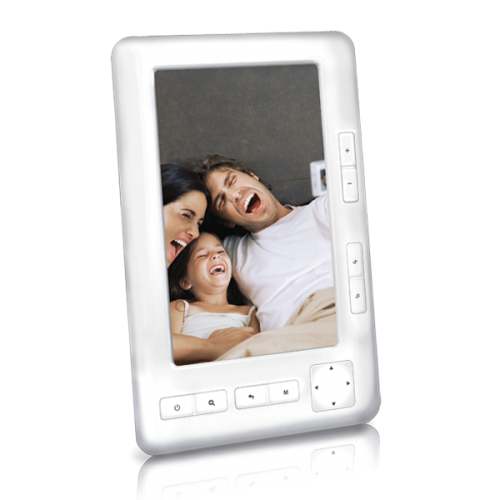 Watch movies, listen to music, view images and read books - all on a glorious 5" full colour TFT ultra thin LCD screen. Load content via Micro SD card (or via USB connection) and enjoy up to six hours of continuous use on one charge (up to 15 hours for just music). The Laser EB101 E-Book reader accommodates all formats of E-book including DRM managed content which is legitimately purchased from on line book stores such as Borders. (if you're considering an E-Book reader, you should check the licensing and compatibility with DRM files). The EB101 is fully licensed and fully compatible meaning more books, more videos, more music, more pictures and more choice.